Click here for a Storify on tweets about this panel. People no longer read The New York Times online. They watch it. 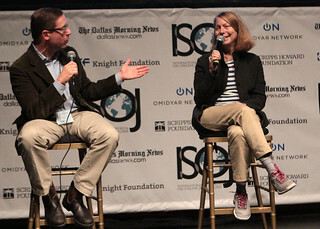 On her keynote speech during the last day of the 14th International Symposium on Online Journalism, the executive director of the New York Times Jill Abramson said digital tools now allow the creation of more exciting stories that integrate multimedia elements in more organic ways. The perfect example is The New York Times’ Pulitzer Prize-winning story Snow Fall, a multimedia package on a deadly avalanche on Washington State that integrated text, photos, videos and bios. The celebrated package emphasized scrolling over clicking and video clips complement rather than repeat the story. The New York Times won three other Pulitzers this year, which had two elements in common: they were international and they were multimedia-heavy. Abramson also spoke about the challenges of balancing the need to breaking the news first and confirming information before publication. The day the identity of the Boston bombing suspects was confirmed, Abramson went to The New York Times’ office at 1 a.m. and left at 7 p.m. The reason: help ensure that the publication did not join the large media outlets – like CNN and the Associated Press – that reported inaccurate information during their coverage. Abramson had her hands on directly on the decision to finally send a news alert with the information.